Doubts about the current Second City show begin with the title. Besides the fact that it makes no sense, there’s nothing in the show about a hotline or about bling and only one sketch has a film noir style. It sounds like a we-can’t-think-of-a-title title, and so it is. 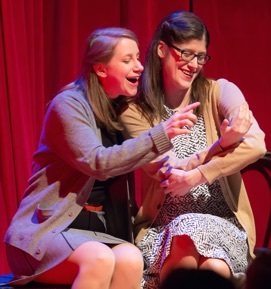 Unlike previous Second City shows that had an overriding theme or at least were cohesive in some way, The Hotline Always Blings Twice really is just a collection of diverse sketches presented in two groupings – topically satirical in part one, character-driven in part two – with the most minimal connections between the two. It’s almost like a double-bill of two different shows where the second, shorter show is much better than the first. The show begins well with Etan Muskat addressing the audience about the threat facing Canada. Canada, he says, is not prepared to deal with the hoards of immigrants that will be crossing the border if Trump is elected president. The speech neatly uses Trump’s own methods to attack the Republican’s most obnoxious candidate. From then on throughout the first part of the show, sketches start well but end without a bang. A skit about a mother (Becky Johnson) who wants to party with her son (Kyle Dooley) at university during frosh week goes on way past its main punchline. Another about an already high couple (Etan Muskat and (Kirsten Rasmussen) who try to buy newly legal weed from a vending machine starts out very funny but has no punchline. One of the longer sketches involves two independent filmmakers (Leigh Cameron and Becky Johnson) who are asked to pitch ideas to four Hollywood producers. For each idea the duo promotes, the four (Kirsten Rasmussen, Etan Muskat, Kevin Whalen and Kyle Dooley) each make the same comments, thus satirizing how Hollywood homogenizes every idea that comes its way. The problem is that the duo pitch four ideas and we hear the same four comments four times afterwards. The producers’ lack of imagination is supposed to be funny but it becomes predictable after the second pitch. The immediate punchline is weak, and the real payoff for this sketch, which is good, doesn’t come until the second part. The same is true of another sketch in the first part. It concerns a longtime Blue Jays fan (Kyle Dooley) who resents the enthusiasm of bandwagoners like the father (Kevin Whalen) and his daughter (Kirsten Rasmussen) seated next to him. The piece makes excellent observations on the views of old-timers toward newbies and of the father who is angry that the old-timer’s resentment is spoiling his daughter’s birthday treat. When the old-timer refuses to do the “wave”, the piece reaches its first peak when he explains that that’s the kind of thing that leads to Nazis. The long explanation the man gives about why he is compelled to spoil other people’s time is beside the point and could easily be excised. What’s more important is the father’s bizarre story of why he is attending the ballgame with his daughter is so crucial. Again the real payoff for this skit doesn’t occur until the second part. Many other sketches in part one take on topical subjects but do little new with them. The scene of a couple who overindulge in binge-watching in predictable. The cinematic chase on the subway almost seems like an ad for the TTC’s new Presto card. Comparing the charisma of Justin Trudeau (Kyle Dooley) to that of a pop star might work but the writers choose the rapping Justin Timberlake circa 2006 thus undermining the point by comparing the brand new prime minister with the singer’s former persona. The only noirish skit that could have given rise to the title depict a society a femme fatale (Leigh Cameron) being courted by the allure of Uber (Kyle Dooley) versus her former standby Bick (Kevin Whalen). The 1940s movie style banter with taxi driving as as extended metaphor for hooking up works well for a time but outstays its welcome especially when a reference to Scorsese’s Taxi Driver (1976) spoils the atmosphere. the other two. As one might expect the scene ends with a big onstage brawl. It lacks a good punchline but what has gone before is so funny and true to life that we don’t mind. The second half includes three routines which could become classics. In one we meet two middle-ages Brits (Becky Johnson and Kevin Whalen) relaxing after breakfast. To challenge the notion that each knows everything there is to know about the other, the woman and the man alternate in revealing increasing bizarre things that they have done recently. The contrast between the outrageousness of what they say and their oh-so-dry delivery is delicious. And to cap it off, the scene, for a change, ends quietly and with great sophistication. The second involved a blind date arranged between a thirtysomething guy (Etan Muskat) and a young woman (Kirsten Rasmussen) by a mutual friend. To the couple’s surprise the mutual friend has also arranged for a another friend with an M.A. in Human Behaviour (Kyle Dooley) to join them and translate typically evasive or downright inaccurate first-date chit-chat into its real meaning. The scene is expertly carried out with perfect timing from all three. Then there is the added twist that the couple, first offended by the third person’s presence, gradually come to depend him to explain what they mean. The best of these three fine episodes duly received the loudest and longest applause of the entire evening. It is show-and-tell in grade school and the next up is a a Syrian refugee (Kevin Whalen). How can this be funny, you wonder, but this time the writing rises to the occasion. The refugee doesn’t have anything for show-and-tell but himself and the clothes he’s wearing because that’s all he has. He naively discusses the differences between Canadians and Syrians. A Syrian might complain, “Oh, my house blew up!” while a Canadian would complain, “Mondays!” At the end he tells us he can learn to become Canadian and to take his freedom for granted as much as we do. A great finish to a monologue that for once in the evening dares to take a dig at the audience’s complacency. 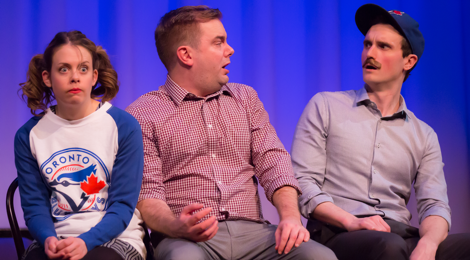 If the entire show were as good as its second half, this would be one of Second City’s best. As it is, the first half needs to be tightened and seriously punched up since it forces us to wait far too long to see how good this great troupe of performers can be. Photos: (from top) Kirsten Rasmussen, Kevin Whalen and Kyle Dooley; Kirsten Rasmussen, Kevin Whalen, Etan Muskat and Kyle Dooley; Leigh cameron and Becky Johnson. ©2016 Racheal McCaig.